The Incredible Hulk was released in 2008 by Playtech. This game contains a set of 5 reels and 50 paylines. The visuals of the game features quality graphics with detailed art styles and textures which are based on the comic theme of a superhero. The game features an exciting music in the background. The symbols on the reels are theme oriented and include Hulk, Gamma Radiation sign, Green Liquid, Police Car, Helicopter and other high value card symbols ranging from Ace to number 9. The highlight of the game is the Progressve Jackpot. Marvel Mystery Jackpot is a multistage progressive jackpot it means that Jackpot is a constantly accumulating prize. There are four levels in this Marvel Jackpot and all the Marvel Slot Games are linked to this feature. The Jackpot feature is triggered randomly in the game. This Jackpot is only available to real money players. The game has 5 reels and 50 paylines. The coin size varies in the denominations of 0.01 up to 5.00 per line bet, and wager 1 up to 10 coins per payline bet. The minimum bet amount is 0.01 and the maximum bet amount is 2500.00 per spin. The Jackpot Payout in the game other than Progressive Jackpot is of 4000 credits per bet line. The game features Scatter symbols, Wild symbols,Expanding Hulk Bonus Feature, Free Spin Bonus, Hulk Smash Featurehas special Hulk Rage Feature, and the Marvel Jackpots. The The Incredible Hulk symbol in the game is a wild multiplier symbol. This means that the The Incredible Hulk wild symbol acts as a substitute for all other symbols except scatter symbol to complete winning combinations. The Incredible Hulk wild substitute symbols only appear on reels 2, 3, and4. This feature can be triggered in two ways. First way: when Incredible Hulk wild symbol appears on central position in reel 3, then the whole reel 3 turns wild and substitutes for all other symbols on reel three and 2 Respins are awarded, in which only reels 1, 2, 4, and 5 spin, and "reel 3" remains wild.. Second way: When the Incredible Hulk wild symbol appears simultaneously on reels 2,3, and 4 then reels 2, 3 and 4 turns wild and substitute for all other symbols on reels and 1 Re spin is awarded, in which only reels 1, and 5 spin, and reels 2, 3, and 4 remain wild. The Smash Bonus, and the Incredible Hulk Logo symbol in the game are scatter symbols. This means that the Smash Bonus, and the Incredible Hulk Logo symbols do not need to appear in a line, on an enabled payline to win. The Smash Bonus scatter symbols only appear on reels 1, and 5and triggers Smash Bonus Feature. The incredible hulk bonus symbols triggers the Free spin Feature. This game is triggered when three or more Incredible Hulk logo symbol appears on reels. In the game players are awarded 10 free spins and all the winnings in free spin round in multiplied by 3x. This feature can be re triggered and all the control buttons are disabled while all the bets and paylines remain same as when the feature was activated. This game is activated when the Smash Bonus symbols appear simultaneously on reels 1, and 5 after a spin. 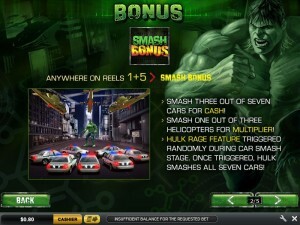 In the game player has to select 3 out of 7 police cars for Hulk to smash and reveal random bonus amount and prize, after that player has to select a Helicopter to win a multiplier value for bonus prize. The Hulk Smash Feature game has a special Hulk Rage Feature, which is triggered randomly. During the Hulk Rage Feature, the Hulk smashes all seven police cars, and the player wins all seven Bonus Prizes before choosing 1 of the 3 helicopters to win a multiplier bonus value. This game has an option to stop the spinning reels according to players wish, by pressing the STOP button. This feature helps the player to create winning combinations. This game is based on the famous comics series by Marvel Comics named Hulk ad was created by Stan Lee and Jack Kirby. The real inspiration of the game is a movie named The Incredible Hulk. All the characters in the game animation and story of the game is based on the it.